Last week, while addressing a crowd in Bolivia, Pope Francis asked for forgiveness: "I humbly ask forgiveness, not only for the offenses of the church herself, but also for crimes committed against the native peoples during the so-called conquest of America." With this, he adds his voice to other religious leaders and institutions in asking forgiveness for the role of the church in the genocide of native peoples and the conquest of land all in the name of God. It is a history that I think about a lot as a white pastor of a church that was founded in 1906 as a mission to the Tohono O'odham. It is a legacy that is always before me as I seek to minister to Native American members of my congregation and community. And it is a reality that we have once again been made aware of as Oak Flat, the sacred land of the Apache, has been traded off in the middle of the night to the highest bidder. Confessing the sins of our ancestors is one thing; but the truth is, we have a lot of confessing to do for our own sins as the legacy of genocide and conquest lives on. But we can't stop at mere confession - we have to move beyond repentance to a commitment to make amends for the devastation that we continue to cause - and we can start with Oak Flat. Oak Flat is sacred land to the Apache. When former chairman Wendsler Nosie, Sr. preached for our congregation, he reminded us that we too have sacred land, sacred mountains like Mount Sinai where our people have had encounters with the divine. But unlike our sacred land, Oak Flat was treated like nothing more than a bargaining chip when Senator McCain added this land exchange with Resolution Copper as a late night rider on a must pass defense bill in December 2014. 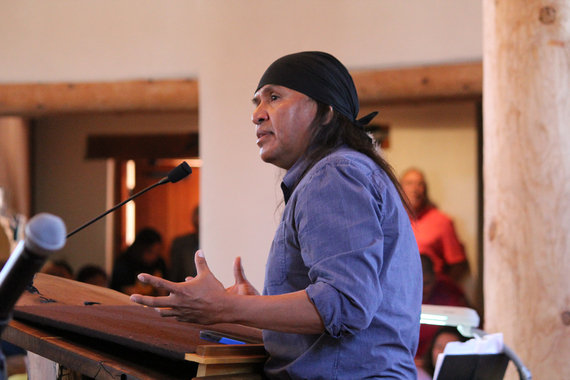 To say that the proposed mine would devastate the religious traditions and practices of the Apache people is only the beginning. We could speak of the 2 mile wide, 1,000 foot deep wound that would result from Resolution Copper's mining; we could speak of the impact on air quality and the unsustainable use of water; we could speak of undemocratic processes; we could speak of treaty violations; but really all we need to do is listen to 16 year old Naelyn Pike when she speaks of her hope of some day taking her daughters to Oak Flat for their coming of age ceremony to realize that what is at stake at Oak Flat is everything. "If Oak Flat were a Christian holy site, or for that matter Jewish or Muslim, no senator who wished to remain in office would dare to sneak a backdoor deal for its destruction into a spending bill -- no matter what mining-company profits or jobs might result. But this is Indian religion. Clearly the Arizona congressional delegation isn't afraid of a couple of million conquered natives." In light of the privileging of Christian religious traditions and practices over that of the practices of Native Americans, perhaps its time for a conversation about Christian privilege. As a nation we have begun a much needed dialogue about white supremacy and privilege, but race is not the only dynamic that creates feelings and systems of superiority; and I must confess that as much as I think about privilege related to my race, class and sexual orientation, I have not spent enough time thinking about what it means to have Christian privilege. Of course, there are those who will argue that somehow Christianity is under attack and perhaps not surprisingly, their arguments sound a lot like the arguments of those who say the Confederate Flag shouldn't be removed. But the truth is that not only are our religious traditions respected but they are defended viciously from every corner when there is even a perceived slight to us. And even as these same people fight to defend constitutionally guaranteed religious freedoms, the religious traditions of native peoples are outright dismissed and denigrated and at best co-opted for our own enlightenment and entertainment. Its time for us to be honest about this privilege and the way in which this mentality is threatening to destroy Oak Flat. 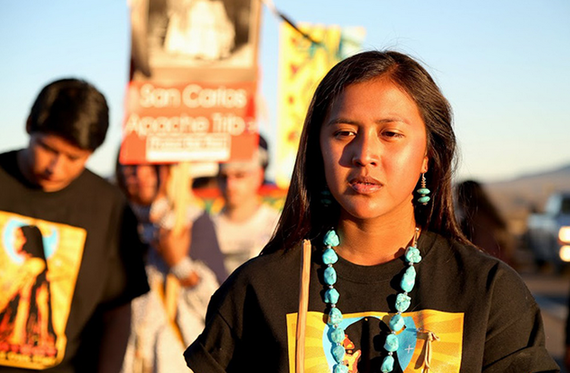 In the beginning of July, members of the Apache Stronghold began a journey to Washington, D.C. in their struggle to defend Oak Flat. As they journey, it is my hope that white Christians might also be inspired to begin a journey of our own as well; a journey deep into our own history and religious traditions; a journey of courage as we seek to be painstakingly honest with ourselves about the way in which our faith and our holy texts have been manipulated and used as a deadly weapon against this earth and against native people. 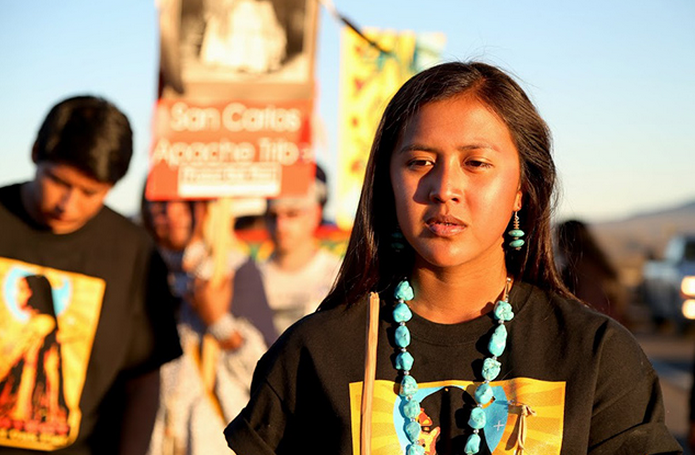 We need to be really honest with ourselves about our own complicity in the mentality that sees no problem treating sacred land like a commodity and the religious practices of native people as something less than our own practices. It can be hard to tell the truth about ourselves - especially because the truth is so horrific. But the truth will not just set us free it will also transform us. And perhaps through this transformation we might let go of all of the cultural cannibalism that we are so fond of; maybe we will stop hanging dream catchers over our beds and instead replace them with Defend Oak Flat posters; maybe we will stop going to pow-wows for fry bread and start going to protests and marches; maybe we will stop trying to make ourselves feel a little bit less guilty about the conquest of native lands by claiming that our grandmother was a Cherokee Indian Princess; and maybe this transformation through truth telling might lead us away from fancy resorts in Sedona offering sweat lodges to the real sweat of solidarity. The truth is that until we acknowledge the truth of our past, our complicity in mentalities of conquest and commodification of sacred lands - forgiveness and pardon will not be ours. 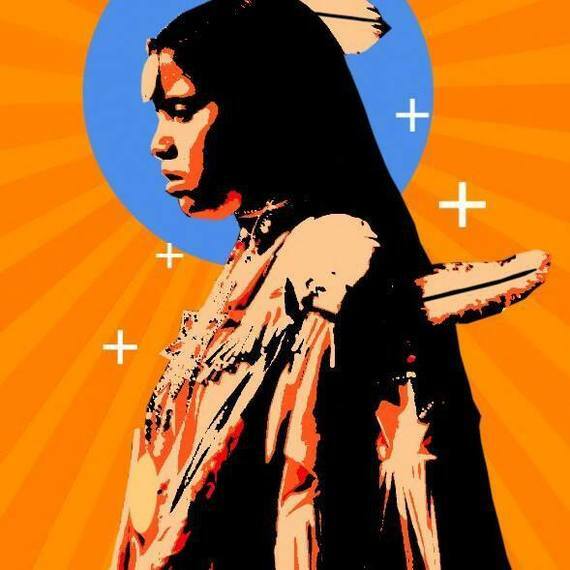 As the members of the Apache Strong hold journey towards Washington, D.C. and fight to defend Oak Flat, let us to journey towards a deeper level of solidarity, deconstructing our white Christian privilege, and always, always defending Oak Flat.